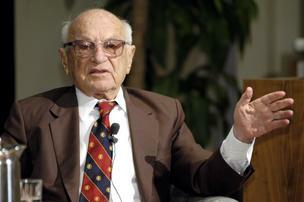 JON FREILICH, Nobel Prize winning economist Milton Friedman in a 2003 photo. More than 40 years ago, renowned economist Milton Friedman referred to the idea of corporate social responsibility (CSR) as a “fundamentally subversive doctrine in a free society,” believing that a corporation’s only responsibility was to its shareholders. Within a decade, CSR was almost universally accepted as a necessity of doing business. Fast forward to today, and corporations are investing dollars and staff to ensure a strong CSR program. Increasingly, these efforts are multifaceted, ranging from giving campaigns (cause-related marketing or simple workplace giving) to formal, structured programs to engage employees in meaningful volunteer experiences. Thanks to the work of Deloitte and Cone Communications, we have been able to track over time the growing demand of both consumers and employees to buy products from, and work for, companies that are good corporate citizens. American Express was one of the early adopters to recognize the leadership development opportunities provided corporate employees when they serve on nonprofit boards. Deloitte’s 2016 impact survey, “Building Leadership Skills through Volunteerism,” noted such leadership benefits from volunteering as: improved communication skills; development of strong character traits and leadership skills; greater ease in moving into corporate leadership positions; and enhanced accountability and commitment. Other studies include the additional value of learning to work with diverse groups. While many companies offer diversity training in hopes of preparing people to work with varied kinds of colleagues and clients, actually working with diverse groups is the best teacher. Working on a nonprofit board provides just such a learning experience. According to a corporate funded study conducted by corporate consultant Alice Korngold study, 81 percent of those serving on a nonprofit board work with fellow board members who have backgrounds different from their own, and 77 percent of the nonprofit organizations on whose boards they sit serve clients who come from a different background. According to the board members themselves, this has taught them greater respect for diverse perspectives, greater empathy for and interest in those with different backgrounds, and a greater understanding of challenges that may face those whose lives have been different than their own. All of this great insight and empathy comes back to the employee’s workplace. A corporation’s direct gain from employees serving on nonprofit boards, though, goes beyond those employees’ professional and leadership growth. Nonprofit board service builds happier employees, and happier employees correlate with employee retention. Almost every person in this study reported their nonprofit work as being meaningful to them. Employees also feel better about their employer when that employer has supported their journey to nonprofit board service. This support can come in three forms: training on what it means to be a nonprofit board member; matching an employee with an appropriate nonprofit board; and providing a financial contribution. Employees who receive both training and matching are more likely than those who receive just training to have a better impression of their company and see that support as a factor in their decision to stay with the company. When a company adds a financial contribution to training and matching, those numbers rise even more, with more than 85 percent indicating that this enhanced their assessment of the company. Many even said it played a role in deciding to remain with the company. But it is not just employees who feel better about their employer because it supported their work with nonprofit boards. Sixty-four percent of respondents say that nonprofit board service provides external reputational enhancement to their companies. While there may be a few more affordable ways to develop leadership skills, key in to employee happiness and augment a company’s brand all in one activity, rather than nonprofit board service, any company will be hard pressed to find it. Laura Otten is director of The Nonprofit Center at La Salle University. For more information about how companies like Dow and PECO are benefitting from preparing their employees for nonprofit board training, through The Nonprofit Center, contact Terri Clark, [email protected], 215-951-5194.